The wood saw helps saw branches and twigs to light a fire when you are in a remote place. Tighten loose screws using the different screwdrivers a small, a large and a Philips screwdriver. With the razor sharp large blade, you can slice through paper, cloth and more. 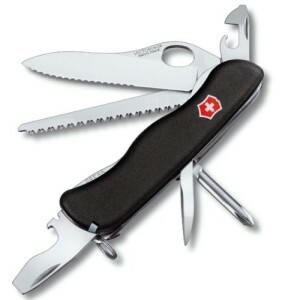 The blade is lockable that keeps your fingers safe when the blade is in open position. The can opener is perfect to open any canned food or drink when you are ready to eat after a long trek. It also comes with a cap lifter to remove the contents of any bottle. The wire stripper helps cut the insulation from electric wires effectively and connects wires. The reamer can be used to enlarge any hole in wood or on any surface required. It comes with a punch that lets a thread pass through for sewing. There is also a tiny key ring that can be attached to a set of keys. The tweezers come useful to pick tiny objects easily. The toothpick can be used to remove stuck food between the teeth or braces.